I’m haiku-ing again! (Can I verb that? I just did.) During Advent, the four weeks leading up to Christmas, I’m going to (attempt to) write a haiku a day. The thought process leading up to today’s haiku was interesting and (I think) share-worthy. So here’s the Promise haiku unpacked. This is the first Sunday of Advent—hope Sunday—and last night at house church we focused on hope. People shared songs, art, verses, exhortations, and teachings, all centered on hope. Also, the United Methodist Church, through their #RethinkChurch campaign, has an Advent photo-a-day challenge. Today, December 2nd, the prompt word is promise. The yellow underlined Hebrew phrase on the left, literally translated on the right side is “that good word”. The orange underlined Hebrew phrase on the left is literally translated “I have spoken” on the right. The yellow underlined word is the root of the very closely related orange word—they both use the same three letters (dalet, beit, reish). In the Hebrew, it reads like the Lord saying, “I will perform that good word which I worded.” I can’t fault the ESV for not translating it that way, that’s awkward in English. But we miss the word play here. An analogy. If you need to cross a stream, do you look for the thin, unstable, rotting log? Or the new sturdy foot bridge? That rotting log is going to fail and dump you in the water if you step on it. But that foot bridge with new 2x6s is going to keep your feet high and dry. Saturday night we talked about where we place our hope. When we hope in things that fail, we are disappointed, and dumped like that rotting log. Some of thing things that we hoped in that had let us down were money, careers, other people. To not be disappointed and stay dry, we need to place our hope on what won’t fail. Someone’s word is considered good when they do what they say they’re going to do. Think of the phrase, “He’s a man of his word.” In Jeremiah 33:14, “good word” is translated as “promise”. The Lord promises to fulfill or accomplish the good word he has spoken. It’s a good word because he’s a God of his word—he will do it. 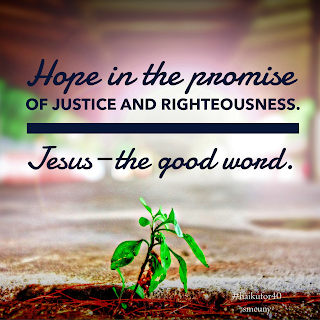 And it’s a good word also because it’s filled with good things—justice and righteousness. 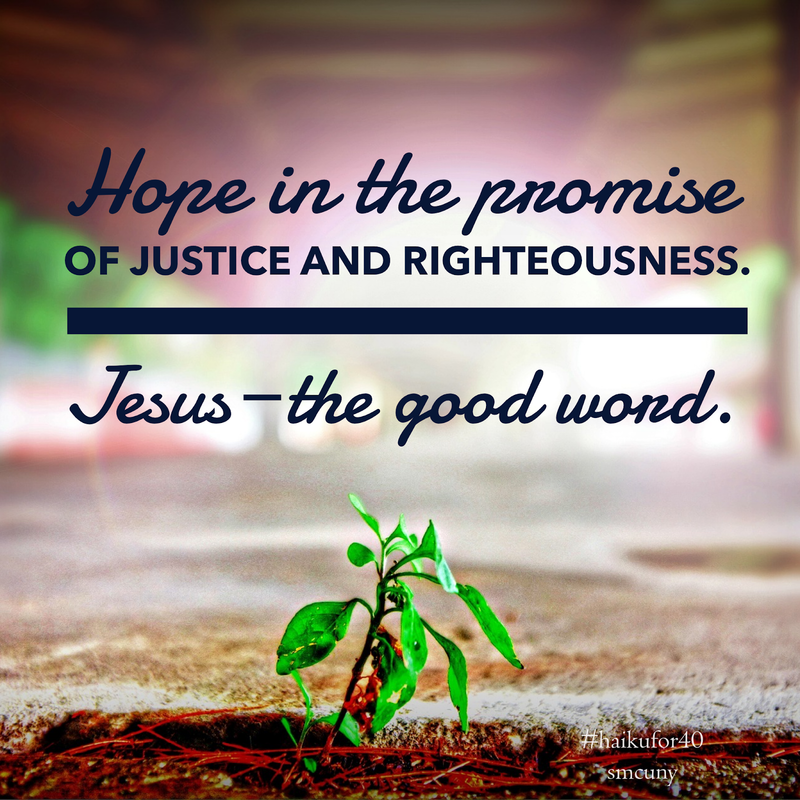 To wrap up, we can place our hope in the Lord's promise. His good word is the Word made flesh, Jesus. Through Jesus, the justice and righteousness our hearts and world groan for is assured and will be accomplished. He is the Word we can place our hope in. You can contact me via email at batmelek[at]gmail[dot]com. I'm also on Twitter @Batmelek. Thanks for stopping by! Bat-Melek's Often Theological Ramblings Blog Posts by Sarah Cuny are licensed under a Creative Commons Attribution-NonCommercial-NoDerivs 3.0 Unported License.